The Week 33 prompt was to use underpaper or paint wipes as part of your art for the week. My tip in used baby wipes and under paper cut into turtles placed all over. I added two pictures I had taken of turtles who had visited my garden. 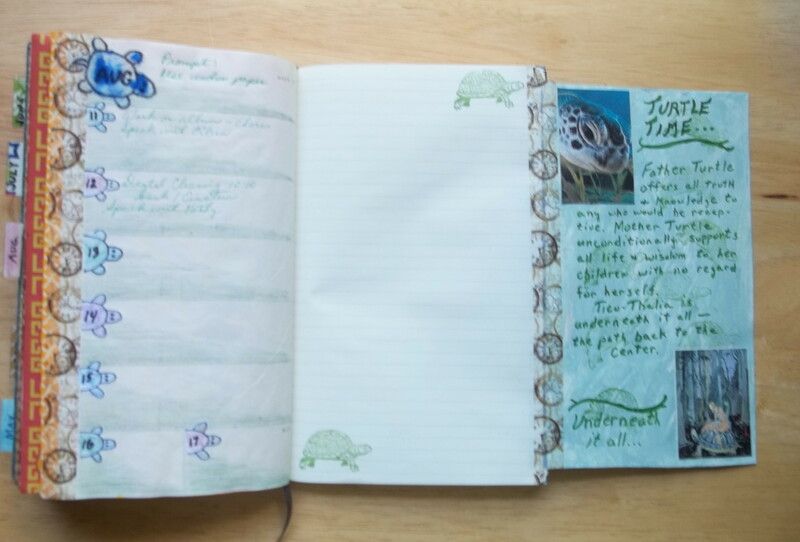 Washi tape is used to connect the extra page to the regular moleskine pages. 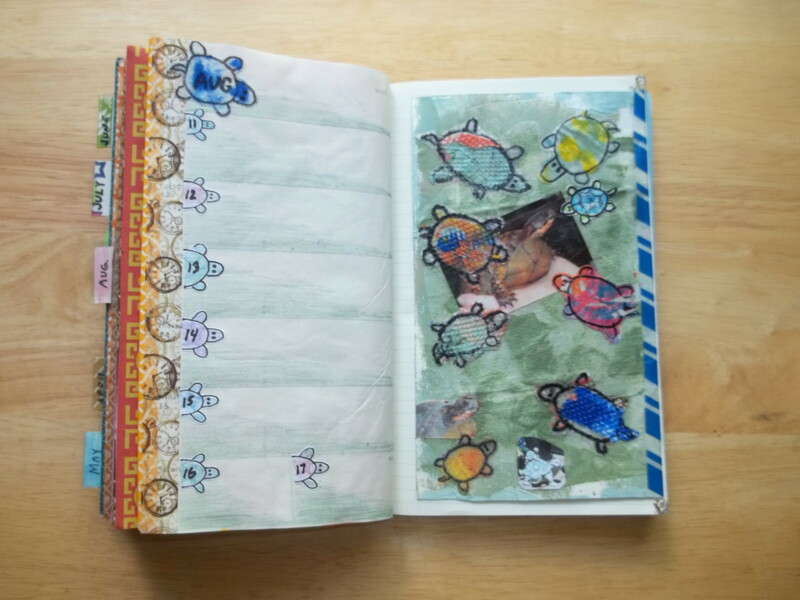 The top turtle on the left, showing the month on the planner page below, is from under paper whereas the other numbered turtles are made from regular painted paper. 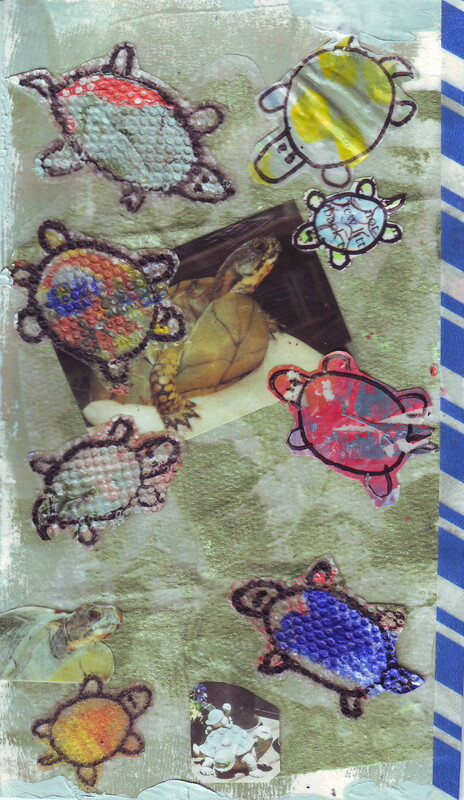 This then developed into the 3 pages with the back of the tip-in showing wonderful pictures of turtles from Pinterest along with a fictionalized ‘Legend’ of Turtle Time with Mother and Father Turtle. This, along with the clock washi tape, provides their sense of long-lived, slowed-down time. Planner and journal are now ready for the week’s events and feelings. As I wandered around Riversleigh forest these last months, in any one of my myriad forms, I occasionally came across various colored bottles scattered throughout. Old, left over from who knows what event, tossed aside when finished, but, who would do that here? Yet these were beautiful, in multiple colors, too nice to have just been discarded. Perhaps they were left, on purpose, by fairies or some other beings. But for what reason? I gathered them into one spot, sometimes having to go back in a larger form in order to pick up and carry the bottle, not knowing what to do with them, but assuming I would eventually find a use. One day, I also found some cut-glass sunflowers in the middle of a shrub which I added to my growing pile of vibrant glass. However, I was a spinning spider that day, having dropped to that shrub from a tree, and couldn’t carry items of that size so I needed to shift into something larger. As a dexterous raccoon three trips worked perfectly. Then I found straight pieces of wire which I could drag to the collection spot, one by one, in my wolf’s mouth. What to do with my assemblage of intriguing objects? Originally all in one pile, I then scrambled the pile to see if an idea presented itself as to what I could do with it all. Then I reorganized the pieces so like was with like. Still no ideas but I liked the tactile feel of the smooth glass as opposed with the cut glass in conjunction of the straight metal wire-rods. Becoming a ladybug, I flitted around the piles of prism bottles reflecting the sunlight, the three glass sunflowers looking like amber jewels, the tangle of wire like the old-fashioned pick-up-sticks. Since rearranging the objects themselves elicited no ideas I thought perhaps a different perspective could come up with what to do with it all. Idea! Put it all together into a sunflower plant with a framework of the wire which would hold the bottle leaf/arms. Then I painted labels on each bottle of my human goals, allowing for one bottle to be labeled “unknown”. Later I found a small statue of Treebeard holding a pearl (left by a hobbit? ) and a brilliantly colored, graceful vase on the beach (what was it’s story? had it washed ashore from a distant land?). Arranged together in a sculpture, they became a focal point in one of my secret groves. A place to speculate on my future: who was I really beyond all the shapes? where was I going? what was I doing? Much to ponder in these quiet times of Riversleigh. ( I wonder if anyone in the future will find this as I found all the components?) Patience was needed to wait for the final realizations to sink in just as patience was needed to collect all these necessary objects. Was this the intent? All will be given you – wait and go with the flow. I was already in this realm of Riversleigh, so it wasn’t for me to get in. Where might I need this? Always more questions than answers. As I mulled this over, the raven flapped her wings and took off for places beyond my sight, so she didn’t want me to shift into a raven and join her. I clutched the key in my palm as I fastened the string around my wrist for safekeeping. Settling back down to once again to resume my time of being small and hidden, I pondered the nature of things appearing when you least expect. What was next? My time in Riversleigh has helped me get further along in my journey of healing my wounded Inner Child. It has been one of the aids along the way: others include spiritual meditation, processing and mulling, art therapy using SoulCollage and Project Life, writing and journaling including memoir, Soul Food and Riversleigh activities, SoulCollage and Project Life. 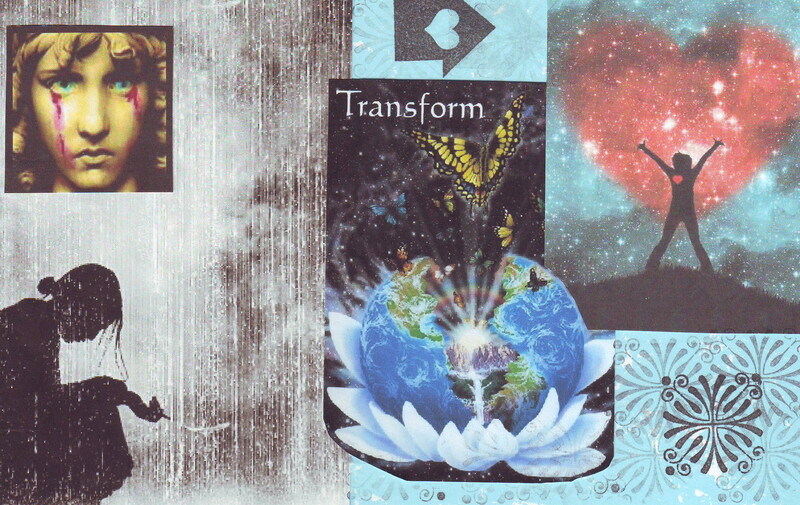 My Wounded Child, depicted in the lower left of this SoulCollage card, has been able to transform and access into the upper right part of the card. Writing the SoulCollage “I Am the One Who” has assisted in the verbalizing the process after much meditating and mulling. Riversleigh has been a place of retreat for me to mull in between adventures. It has symbolized the quiet silences in the spaces between activities. I have stayed in Riversleigh even as others left: as a shape shifter I could adapt and blend into whatever was happening and whomever was there. The quiet time has been necessary, but then there comes a time to be with others again, to share in each others’ lives and appreciate the growth patterns we all have undergone. There seems to be more activity of late at Riversleigh. For quite a while nothing much went on other than various animals, birds, fish and insects living their lives. As a shape shifter, I am equally at home moving from squirrel scampering up a tree, to hawk catching the updrafts, to a fish in the stream, to a wolf prowling the tundra, to a turtle burrowing into the ground for winter’s hibernation, and so on. Occasionally, I would transfer to the barest hint of a human, sitting and observing the beauty of nature and its inhabitants, and the patterns of life. The freedom to do whatever I wanted and to be whatever I wanted was exhilarating. All forms were possible. And all forms were pleasing as each expressed a different part of myself and my Inner Child. During this time I often reminisced about the days when Riversleigh was more fully occupied and inhabited, and how I interacted within the parameters of those people. A rich realm, filled with unlimited potential for all – truly a blessing! “We fear that we are inadequate, but our deepest fear is that we are powerful beyond measure. 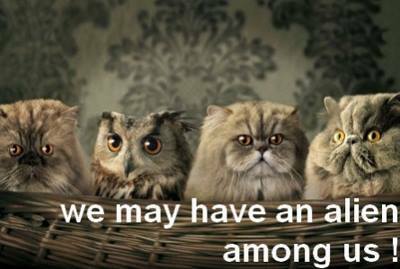 Actually, who are you not to be these things? There is nothing enlightening about shrinking so that other people around you won’t feel insecure. Shivering, she darted across the snow, her feet making no indentation in the white crust glossed on like a final coat of icing during the last freezing rain. She had been hiding in the woods, trying to keep warm and dry, afraid to enter the rambling house whose lights beckoned with such welcome and warmth. Hesitant, not sure if she had anything to offer, she hesitated, watching as the doors of Riversleigh opened to invite in others as they arrived. A gust of wind pushed her physically and mentally toward the entrance wreathed in lights. The door was chinked enough to allow her egress, so she slipped in, unnoticed. Scurrying along the wall, she followed the scent of delicious food into another room. People moved to and from the table, placing items on their plates. She was able to move unnoticed, checking out one morsel after another. Memories wafted to her along with the fragrances of baked cookies and other treats, laced with wisps of music drifting from an even different room, punctuated by the chatter of adults and the laughter of children. Chocolate, walnuts, pumpkin, cheesecake, apple pie, fruitcake-all satisfied the palette and the expectations of Christmas. Full for the moment, she moved into a secluded corner to sit and relax, even as she took note of some things being different. Her mind drifted back to that first Christmas in Panama, which wasn’t her idea of what Christmas should be. What did I learn from that Christmas that has helped me deal with change ever since? Does that Christmas in Panama and this one in Riversleigh have any similarities? She thinks it is mostly about finding patterns leading to transformation. The ability to transform what is to what might be, and what one expects to what one actually has is so important. The journey I took that first Christmas from being sorry for myself to gratitude for what I had, and then sharing some of that abundance with others transformed the day into a real Christmas in any climate. Mundane transformation occurs even after taking individual ingredients and stirring them into a cookie or a cake or a meal or of taking material and creating clothing; creative transformation occurs when taking words and making them into poetry or memoir or when taking individual colors and images and making them into art. One can influence the transformation of how most people view death to allowing for dignity and transformation in trauma; or moving from the grief of loss into grateful healing and wonderful memories. And the transformation of dying into transformation itself. Transformation can also be changing one’s physical shape to fit the occasion, thus allowing for the next new lesson to be learned as one walks in another’s shoes. Each transformational experience releases us from the focus of ourselves to identifying with others, whoever they may be. And the ages-old transformation of having reached the darkest day to moving towards the light, even while recognizing that in this world of duality, what is Christmas Winter Solstice in one location will be Christmas Summer Solstice in another. Riversleigh appeared to be a place where interesting things might happen. And the guests looked extremely intriguing. Maybe she did have something to offer. 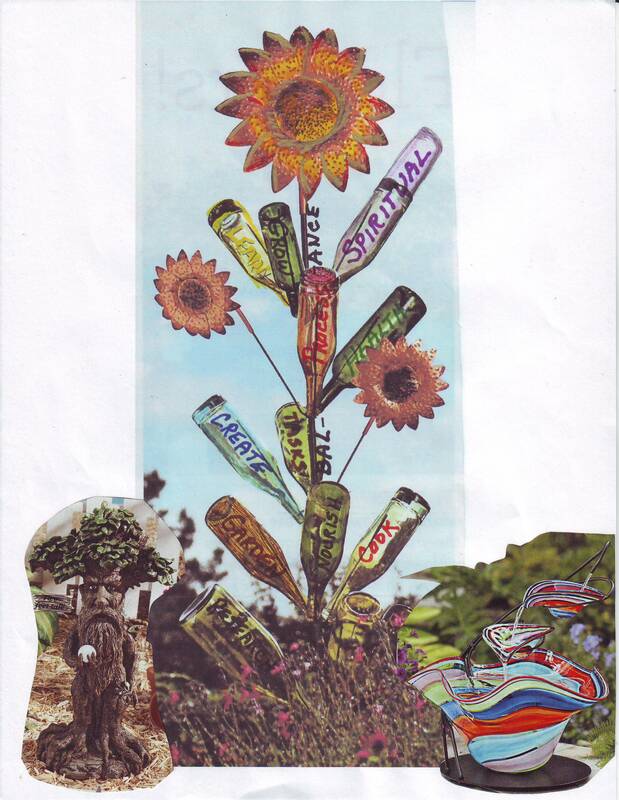 She had been enjoying being involved in Soul Food Café and its many activities, as well as doing SoulCollage cards, and now combining the two. A shape shifting character had emerged on its own, one who travelled on the various journeys that seemed to be versatile enough to intrigue readers. She glanced down at her tiny paws and thin tail, twitched her whiskers, darted among the feet of some people as she ran under the settee. She might stay here for a while as she was. There were good things remaining to eat after a party in this house. But she will have to watch out for any cats or other critters that might like to nibble on a mouse. Settling into a steady swim with broad sweeps of her powerful tail, Thalia moved quickly over the ocean floor strewn with shells, little fish seeking food, a discarded can here and there previously tossed onto the beach by someone careless and taken out with the tides, pieces of beach-washed and eroded glass of various hues from old soda and beer bottles. She wasn’t exactly sure where she was headed so she ranged along the shoreline a bit, looking for something that would show her the way. There was enough of the human in her to be annoyed at people throwing things away rather than recycling or at least placing into garbage bins. The fish part just observed the objects as part of the landscape. Until one gets caught in a plastic ring holding a six-pack of cans togetheror swallows a metal tab from a can. None of us seem to be really aware until us, or someone we love, are hurt. She entered a current leading away from the beach, a current of warmer, faster moving water. Deciding to follow that for a while, Thalia changed direction with a flip of her tail and her fins, and basked in the warmth of the water. She could see lights flickering in the distance and assumed it was the play of sunlight on the surface, reflecting down. But she could discern colors in the light as she approached, colors becoming increasingly vivid and tantalizing. The colors of the rainbow! Here is where the rainbow intersected with the sea. How beautiful! But the other fish seem to be avoiding the area. I wonder why? It would be like my time of riding the rainbow to Rainbow Beach. All that color and light surrounding me, embracing me. Dare I risk it? Will it be the same or is there a problem? She circled around and around the area where the crayon-lights penetrated the water, watching the fish as they approached. It was almost as if there was a barrier: they would swim up to a point, then turn around and dart away. The colors sparkle! It looks as if the light-crystals would penetrate into whoever or whatever was in its path. Light therapy! Let the body be immersed in colors of all hues to help heal and become whole. But there is also a hum, a sound, emanating from the rainbow. Light and sound therapy! So each organ and body part takes what it needs to move to the correct vibration, whether of light or sound or any combination it needs for wholeness and wellness. Each being knows what it needs. This would allow each part to receive the frequencies necessary for its growth. Synergistic! The whole is equal to more than the sum of its parts. The merging of sound and light—what could be better? Thalia edged into the whirling mix of colors and sounds, arching this way and that to be sure all parts of her were exposed. She wound up automatically twirling in the encounter, not sure what she was seeing or feeling or hearing. Closing her eyes momentarily, she gave herself up to the experience. Once again she was riding the rainbow. 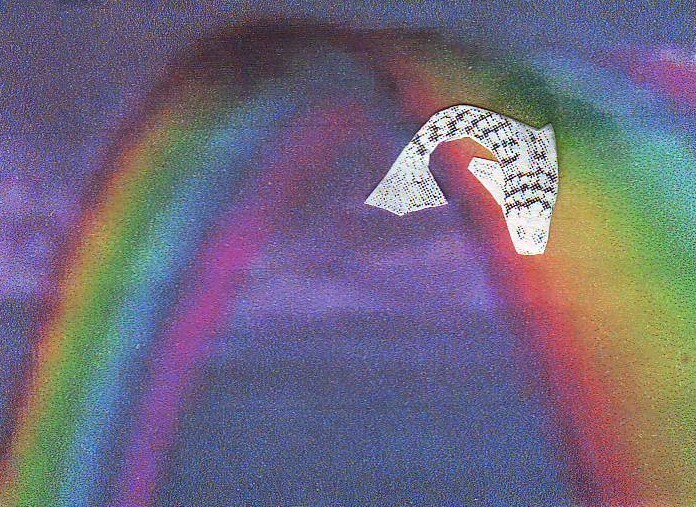 But this time she was not only riding the rainbow ever upwards through the ocean, she continued the ride into the air as the rainbow curved around the earth, then up into the heavens. It was all part of her, one with her. She was that and that and that as she encompassed all things. She rose so high she was now coming back down, around the earth again, and then up through the earth and emerging into the ocean again. She was back where she started, but was no longer who she was when she started. She recalled the quote by TS Elliot: …the end of all our exploring will be to arrive where we started and know the place for the first time. Then suddenly, the colors and sound disappeared. In their place was darkness and silence. She waited, holding on to the sense of wonder. The smell reached her before she could see what it rode on. A putrid, disgusting, overwhelming smell of fumes and sulphur and noxious toxins. She recoiled reflexively as her gills reacted to the smell of decay and corrupting flesh. The darkness thickened, shimmered and took on a hideous form. Was this the Triton she heard about? Half man and half fish? Exacting a price to allow anyone to pass to the Island of Mudjimba? She remembered pictures from mythologies, teeth bared, grotesque smile. The better to eat you? The smell and sight was so overpowering, she wanted to recoil from him. Not just odious, but a sense of evil emanated from him. The hell-fire red eyes added to the sense of evil. Was this Triton? Or something else? Much worse? The smells became suffocating, and the baseness, the heaviness of his presence seemed to drag on her. Repelling–yet drawing her as a magnet of negative pole draws one of positive pole. Lumps all over his face and body, maybe tumors? Black, sharpened teeth. Arms outstretched as if to welcome but seem more ready to envelope and annihilate. And yet? She knew she was that, too. She needed to relax her fears and extend love to this creature, whatever it was. A few deep breaths, a remembrance of the rainbow experience and the connections to all things, “this, too, oh Lord. I am that.” She could feel the love fill her from Grace, and pour out of her, from Grace. She reached for the black crystal in her hair and offered it to him, in love, in connection. His aura altered as he graciously received the crystal, and held it close to better see. Thalia could observe the crystal first enhancing the red fire from his eyes, but then changing it into many colors, like the rainbow, and finally, into sparkling white light. His appearance changed. 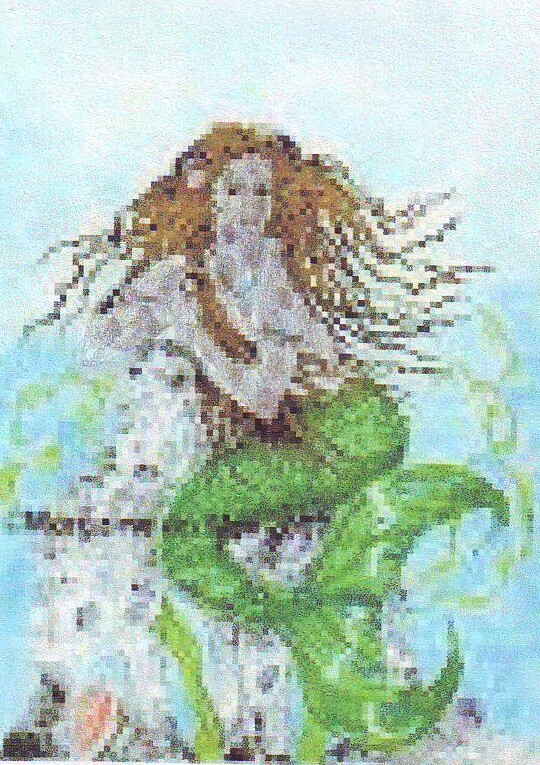 Long seaweed-rope hair, crystal ocean-blue clear eyes, human upper body and arms with green fish tail. Still strange but more familiar. His words bubbled out: Sirrssle…welcome home! You’ve been away for a long time. We’ve missed you. What do you mean? Who are you? I am your father, Sirrssle. You disappeared many, many tides ago. We could find no trace of you. I gave you this black crystal when you matured to the egg-laying stage, to protect and remind you of your ocean origins, no matter where you travelled. And now you bring it back to me. I am the Guardian of the Deep. Those who are frightened of me in my other form, flee. Those who can accept or even love, are allowed entrance. You have returned to your family, from once upon a tide. But I am human now. You did not appear human as you swam here. I am able to shape-shift. Can humans do that? I didn’t know that. They can if they focus and are able to move beyond themselves and what they think is their identity. Most don’t. But I don’t look like you. He held up a polished piece of glass, now a mirror. She could see herself, no longer all fish but now a meld of fish below with green scales on a fish tail with human features. Well, not exactly human—my face would be considered ugly by human standards. My long, rough rope-hair looks rather coarse and ungainly, and is such an odd shade of brown with green highlights. And my skin is really slightly scaly with protrusions that I thought were tumors on him. No, I would be considered ugly. But somehow he…father? Doesn’t seem so ugly now. He seems natural, like a mer-person. Pre-Atlantian or future earth… or both? He swam off, to who knows where? She hesitated, looked in the mirror again, then followed. Thalia had met the Triton, and he was her. Talking with the people gathered at Rainbow Beach, Thalia heard mention of others who already departed to travel to Mudjimba Island and the Triton that one has to meet before being allowed entrance. First arrange for a ferry, then be literally dropped off into the water to meet the Triton and appease him in some undefined way, and then, hopefully, finally getting to the Island. What a long drawn-out process. The ferry is away on a trip so I would have to wait for its return and then do my own bargaining. I wonder if there isn’t a quicker way so I can catch up with the others. Sounds like the more adventurous are already there. And who is this Triton? What does he want from me? I just have some odds and ends in my satchel—I can’t imagine there would be anything he wants. She sat down on the lovely sand, specked with the now-crystal Crayola specks from the Crayola Rainbow. Gathering up a few of the crystals and watching the interplay of color and light, Thalia decided to look for at least one crystal of every color. How long will this take? But how beautiful they are. Definitely worth the time to create a ‘Crayola’ box of 64 light-crystals. Just read that the box of 64 is now 50 years old after having been introduced on the Captain Kangeroo TV show in 1958. Crayola says more than 200 million of these boxes were sold containing enough crayons to circle the earth 24 times. Maybe that is where my Crayola Rainbow Ride came from. Yes, wouldn’t that be wonderful—bombs of Crayolas—of color to delight instead of bombs to kill. Look at how they catch the light and shimmer. It’s like a kaleidoscope, a light show. She held the crystals this way and that, becoming totally immersed in and mesmerized by the sparkle. Atlantis rises again, just as they said it would. We measure the rise in barely perceptible increments, thus allowing us time to formulate plans and, perhaps, time for us to adapt. As the ancient ones always said, a world gained is a world lost. We go to survey the changes, Sssss-irl and I. We will then return and report to the engineers so they can calculate how much time remains now before new evacuations are needed. 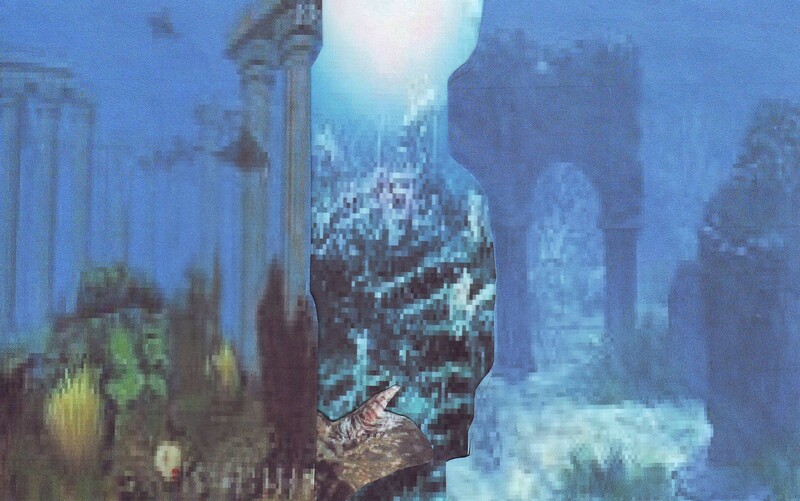 Swimming to the rising Atlantis, we scramble over chunks of marble gleaming in the moonlight to the apex of the high temple ruins and measure the distance to water’s edge. Each moon-pass saw us there, walking a heartbeat’s distance further down the slope. The incoming waves scour the marble one final time, a final smoothing-out of edges originally rough when entering the deep, and worn smooth over the millennium by the peace of the water. 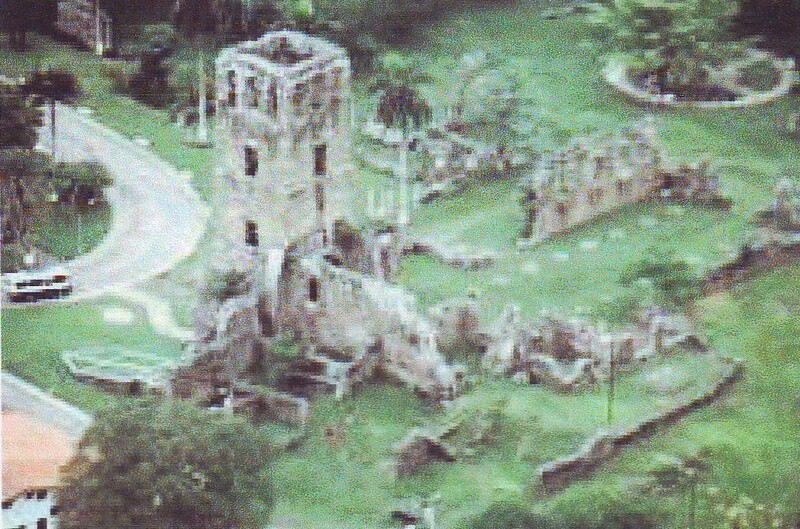 I remember playing amongst the original columns and buildings, running lithely, the one who is now Sssss-irl chasing, never quite able to catch me. Those were the lifetimes when we could run gracefully on land. Now, all has changed. We have changed. But still we play amongst the ruins, swimming and frolicking with ease, enjoying the light filtering through the water as flocks of multi-hued fish glint colors as they bank from one side to the other. Sometimes the big fish, the Sharp-Teeth Eater, would appear, scaring us into hiding amongst the marble half-hidden by plant-growth. 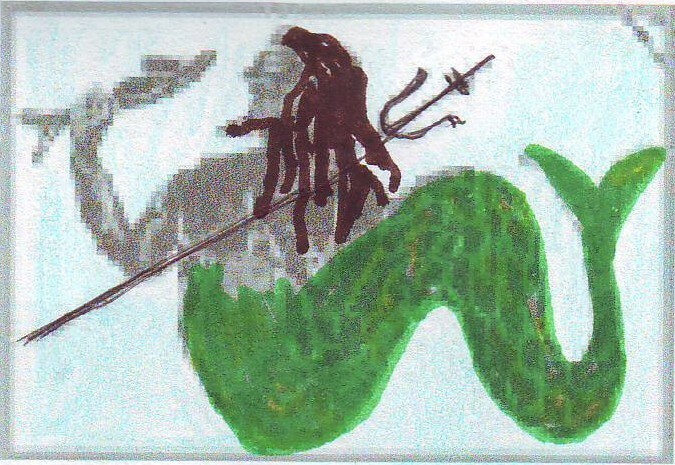 We wriggle down into the algae, becoming as still as the ancient skeletons of lost civilizations entombed with us. As we wait, the shadow of Sharp-Teeth and old times passes over us, and we remember. It is the transitions that are hard. Over time, we move from one form to another, initially not remembering the others. But during moments of quiet and awareness, the impact of the whole can overwhelm. Questions swim and dart like a flock of fish as we wait. How long will it take? How long did it take? What will happen to us this time? Should we even try to adapt – once again? We haven’t totally completed the last transition, and now another? 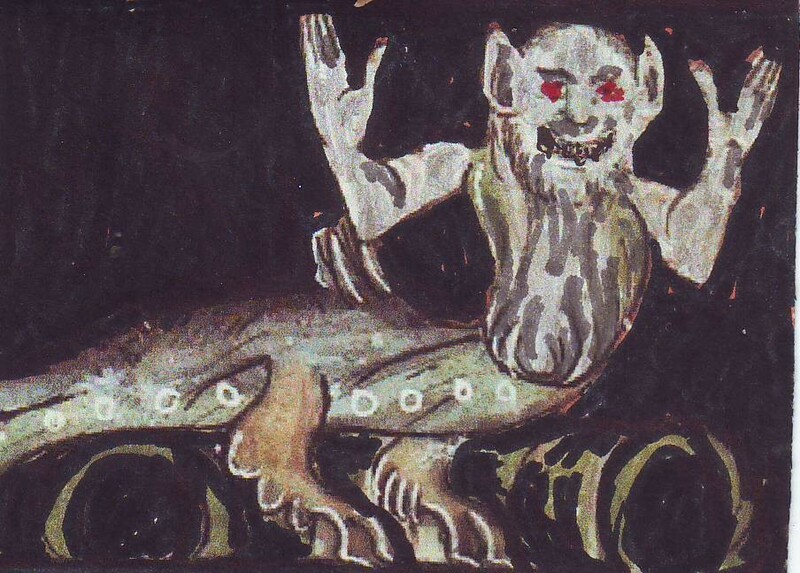 With a long out-breath, hiss of water over gills, I turn to Sssss-irl and observe her legs almost blended into powerful back flippers, remnants of fingers showing from front flippers, eye membrane complete over eyes that have gradually migrated sideways to increase visibility to 180 degrees. Yes, over the ages we adapted to our watery surroundings, and now? Now what? Do we stay below and continue this process, or rise above and start the reversal? Atlantis rises again. Whoa! What was that? When was that? Who was that? But it gave her an idea. Why wait for the ferry? I can change shape and swim to meet the Triton. Who knows what sights are in the waters around here? She carefully gathered all the lovely crystals. Tucking the largest jet-black crystal into her pocket, Thalia placed the rest into a plastic baggie from her satchel and returned the bag of lights into the satchel, feeling sad as their sparkle disappeared from view. She walked to water’s edge and sat down with her legs extended into the blue world. Thalia then took the black crystal from her pocket and wound it into her long hair. A moments pause, focus, intent… and she shifted, flipping to face the water, then squirming deeper into the brine, satchel diagonally across her scaled body, legs now fused with tail flipper. Another wriggle and the satchel settled into a better placed for long travel. She was on her way to search for Triton. She found herself walking back to the entrance to the catacombs, taking a torch, going past the statues of Jesus, the angels and the gargoyles, wondering if she would be able to find her way back to the Hall of Remembrances. Walking down one tunnel, Thalia came across a statue of a regal-looking cat on a tombstone. Oh, oh. I didn’t come this way before. Must have taken the wrong tunnel. I would have remembered seeing this sleek cat. What does it say? No date. Wonder when this is from? Wonder about the name—seems like an obvious combining of Bast and Sekhmet, both goddesses in Egyptian mythology, but is it? Was Bast the name in itself or short for Bastet? That would say a lot about the date right there. And both gentle and fierce—how intriguing. Well, the solid black statue doesn’t tell me why this cat was named a composite name of two Egyptian goddesses generally depicted as lionesses. A faint noise coming from behind the tombstone caught her attention. She listened, heard it again, and cautiously moved around in that direction. She almost didn’t spot the kitten curled up on the floor, pressed against the tombstone. The kitten’s thoughts came through. That is me. I’m Bast-Met. I’m actually the kitten who became Bast-Met. But I’m still confused. Why are you confused? You were obviously loved by your owner. Yes, I was. But people don’t realize how important a name is. I was confused because I was named after two different aspects of goddesses, even though both were lionesses at one time—Best and Sekhmet. Lions? I thought they were cats. No. Bast was the ancient Lower Egypt solar and war goddess and protector. She was depicted as a fierce lioness while also associated with the sunlight so was called ‘Goddess of Fire’ or ‘Lady of the Flame.’ Later she became Bastet, her role diminishing as Sekhmet , a similar deity in Upper Egypt when Lower Egypt lost dominance in the unification of the Upper and Lower sections. The feminine suffix of ‘et’ is the diminutive name that applies as she receded and Sekhmet rose to power. Her gentler aspect as protector of the home and pregnant women changed as her appearance changed to a domestic cat. Then during the times when the Greek occupied Egypt, she changed again to a goddess of the moon. So Bast become Bastet and took the appearance of a domestic cat. Why would a cat still be important? Cats were revered highly because they could catch and kill threats to the fragile food supply like rats and mice and snakes. So much so they were mummified before burial. 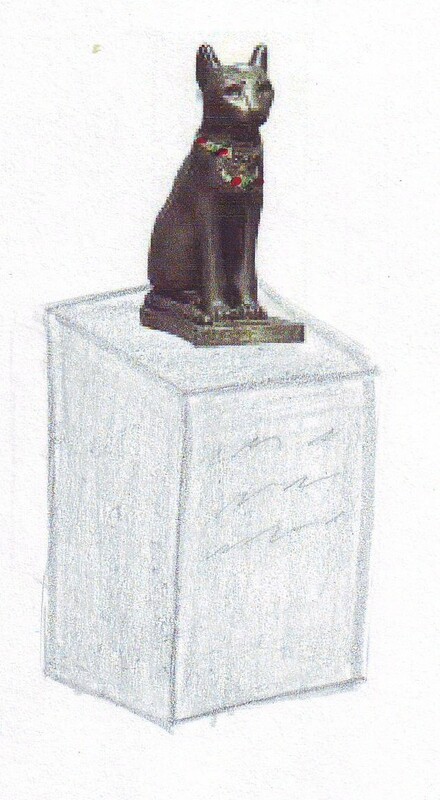 More than 300,000 mummified cats were discovered when Basts’ temple at Per-Bast was excavated. What about Sekhmet? Was she also a lion who changed to a cat? Sekhmet was a warrior lioness goddess of Upper Egypt, the lioness being the fiercest hunter the Egyptians knew. They thought her breath created the desert and so she was a protector of the pharaohs. She was also a solar deity and became more powerful than Bast, so was seen as ‘The Avenger of Wrongs.’ Sekhmet was also seen as a bringer of disease as well as a healer of those diseases, with her worship centered in Memphis. ‘She Who Is Powerful’ was depicted as a woman with the head of a lioness. Pyramid texts themselves say the Pharaoh was conceived by Sekhmet who was the wife of Ptah, ‘The Creator.’ Other myths say she was created by the fire of Ra’s eye to use her as a weapon of vengeance to destroy men because of their wicked ways. Sekhmet is the Goddess of the West and Bastet is the Goddess of the East. Both are shown with heads of lionesses with Bastet wearing green and Sekhmet wearing red. So that’s why this statue has a jeweled collar of red and green gems. A while back I even saw a refrigerator magnet with a picture like this statue on it. Quite a contrast between being considered goddesses and being on a fridge magnet. But why are you still here? I was always confused as to who I really was and my mistress expected two different behaviors—sometimes I should be like a lioness, the aggressive war goddess, and other times I should be gentle like a healer and docile protector of pregnant women. Mistress would encourage me to be ‘Avenger of Wrongs’ and ‘Lady of Slaughter,’ both titles of my suffix namesake. But then would be upset when I caught a rat and brought it home to her to show I was the ‘Lady of Slaughter.’ No, now she preferred for me to be tame like the mummified cats. And all I wanted was to be me—a kitten needing to be petted and loved and let to develop naturally, not forced into predetermined roles. Would you mind if I write your story down? Because this also applies to modern day parents and children. It does? How? I thought it was because I couldn’t talk to my mistress. No. Even when children are all grown up and can discuss issues like this with their parents, it usually doesn’t help. Because parents who try to force children into a mold they want usually aren’t able to truly listen and understand what is being said. Parents who listen and understand from the beginning usually tend not to force anything on anyone. They realize each has their own way to grow into their adult selves. By this time the kitten was curled up in Thalia’s lap, purring as she was stroked. She stretched out, putting her front paws on Thalia’s shoulders. Thank you for listening and helping me to understand I was not alone in dealing with the expectations of others. I would be verrrrry happppy for you to wrrrrite my storrrry. I just wwwwanted to be mmmmme and not torrrrn in two diffferrrrent dirrrrections. Can you call mmmmme Kitty? The purring increased in volume as Kitty’s substance solidified and matured. Thalia and Kitty rubbed noses. Then both Kitty’s purring and her body faded and disappeared as Thalia continued to stroke the empty air while thinking of an anonymous quote she had seen: “Thousands of years ago, cats were worshipped as gods. Cats have never forgotten this.” One more contrast. Treated as goddesses and important enough to be preserved as mummies but now the likeness is on refrigerator magnets. She said ‘NO’ to both aspects—she just wanted to be Kitty. Thalia inhaled the wonderful, familiar smell of the ocean and listened to the gentle lapping of the waves onto the beach. Nearby, a group of people were dancing and delighting as the creative rainbow flowed onto the beach and everyone on it. She was about to join them, but still felt a little dizzy from the marvelous Rainbow/Comet ride from Tholos, so she looked around for a spot where she might be able to sit quietly and gather all her senses back into the here and now. A little ways off were what appeared to be, stone ruins barely visible above the undulating sea grasses. She ambled along a path and came upon a cluster of old ruins. Thalia walked over to the closest one, placing her hands on its rough surface. She then moved from one to the other, touching the remaining stone walls and buildings, feeling the heat the stone captured from the sun. 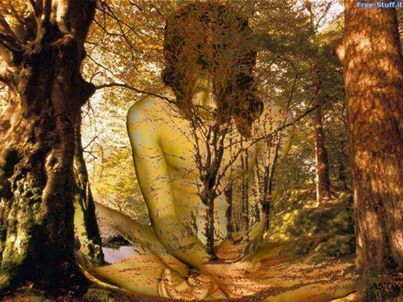 She sat on a protruding rock, leaned back, felt the solid stone beneath and behind her, great for grounding her. Closing her eyes, she allowed her mind to drift on the still-heard sounds of the nearby rolling tides. The warm air soothed her skin that had become somewhat cold from the comet portion of her ride. It felt good to feel the heat to penetrate into her, warming her core. She smelled smoke just as she felt a sudden heat blast surging through the rocks and stones into her. Thalia jumped up and was thrown into masses of people yelling as they stampeded for cover. “Pirates!” “Pirates are here! Run for your life!” “It’s Morgan the Pirate!” Screams, smoke, chaos surrounded her as people scrambled every which way to escape. She started to seek cover, but then realized they moved right through her, seemingly oblivious to her presence. She was the observer of this madness—she wasn’t actually there in it. Thalia then recognized what she was seeing. Years ago, when she was first married she lived in Panama for almost a year. While there, she and her husband, and 2 of his service buddies, went to visit Old Panama—Panama Viejo—after a Thanksgiving dinner at their apartment. She loved walking among the many stone ruins and then reading about the history of the place, which was fascinating. Old Panama was located near the ocean. Her husband took many pictures, most of which were turned into slides, with a few later made into photographs. 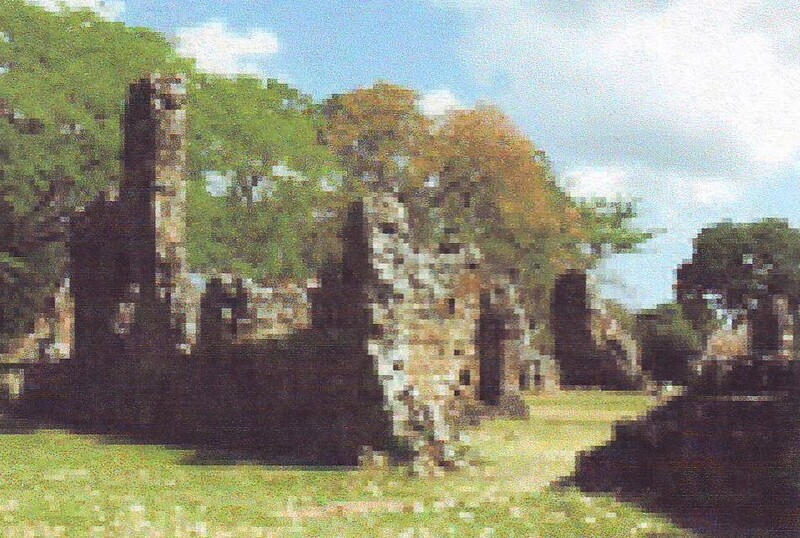 Panama Viejo, a World Heritage site founded in 1519 by Peter Arias and 100 other inhabitants, was the first permanent inhabited settlement in the America’s along the Pacific. After being presented with a coat of arms by Charles V of Spain, the town became an important base where gold and silver gathered from Peru was sent back to Spain. Much wealth accumulated in the port city. By 1610, the city grew to a population of 5,000 with 500 homes, a convent, a hospital and a cathedral. At the beginning of the 17th century, the city had been attacked by pirates, attracted by the wealth, and by the indigenous people of Darien. An earthquake in 1620 and the Great Fire in 1644 destroyed much of the city, which was then rebuilt. 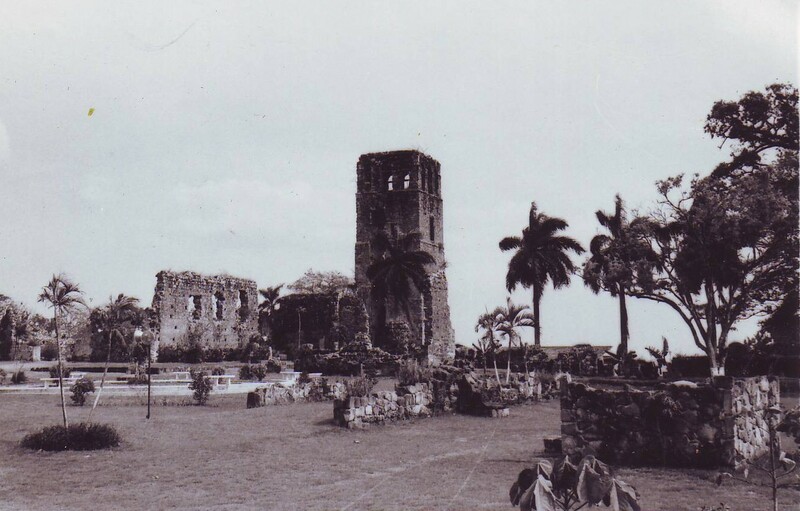 Morgan was arrested and taken to England, proved he had no prior knowledge of the peace treaty between England and Spain, so was knighted in 1674 before returning to Jamaica to assume the post of Lieutenant Governor. He died in 1688, one of the few pirates able to ‘retire’ from piracy. Errol Flynn’s 1935 film, Captain Blood, was loosely based on Morgan’s life. 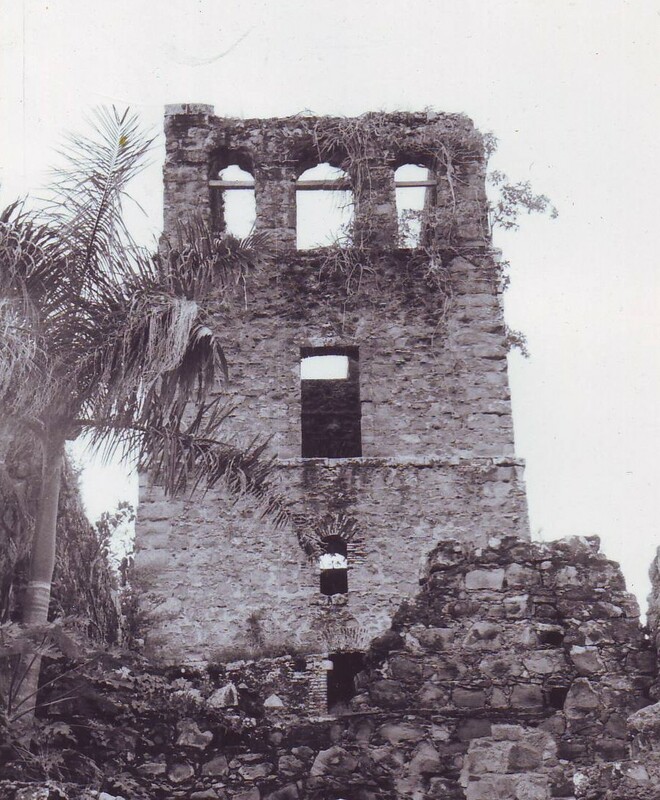 Panama Viejo was so peaceful when Thalia visited it in the early 1960’s—a contrast to those tumultuous days in 1671. An even greater contrast was the real damage pirates do compared to the entertainment versions like Mary Martin in Peter Pan where Thalia was thrilled to see her glide across the stage in the play and loved the Walt Disney cartoon-movie version of Captain Hook. And, of course, Treasure Island by Robert Louis Stevenson. The modern version of pirates was presented in Pirates of the Caribbean. Quite a difference between the brutal reality and the romanticized fictional. But it is nice to be aware of both as each balances the other. Thalia got up and walked to join the others on the beach. I love my time alone, but I also love time spent with people. Good balance—to be able to ride the Rainbow and to walk the sand.